Looking for an exciting adventure? Welcome to the Carpathians! 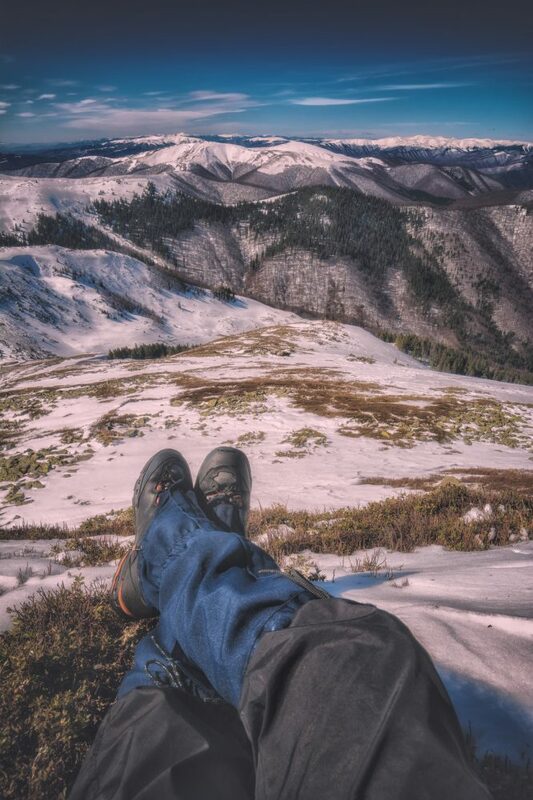 The second-longest mountain range in Europe includes Ukraine’s highest peak, Mount Hoverla (2,061 meters, Ivano-Frankivsk Oblast), and a year-round tourist and recreation complex that offers a great number of breath-catching outdoor activities. The Carpathians are a real pearl of Western Ukraine, located 650 to 750 km from Kiev. Fresh air, great mountains, unique landscapes, beautiful national parks, and a wide choice of mineral and thermal waters make the Carpathian range an extremely popular tourist attraction. Note, this is a particularly popular destination in winter, so it is better to make hotel reservations a few months before the trip. Developed ski trails with varying levels of difficulty, winter sports competitions, and a great tourism infrastructure including ski equipment rentals, all these are waiting for you here. The season starts in December and lasts till March or April, depending on the weather. Travel tip: It is much cheaper and less crowded in the Carpathians in February and the beginning of spring. Here you’ll find one of the largest top-ranked ski resort in Eastern Europe, Bukovel (Ivano-Frankivska oblast), that is situated on five mountains and notable for the high level of service and well-developed tourism infrastructure. 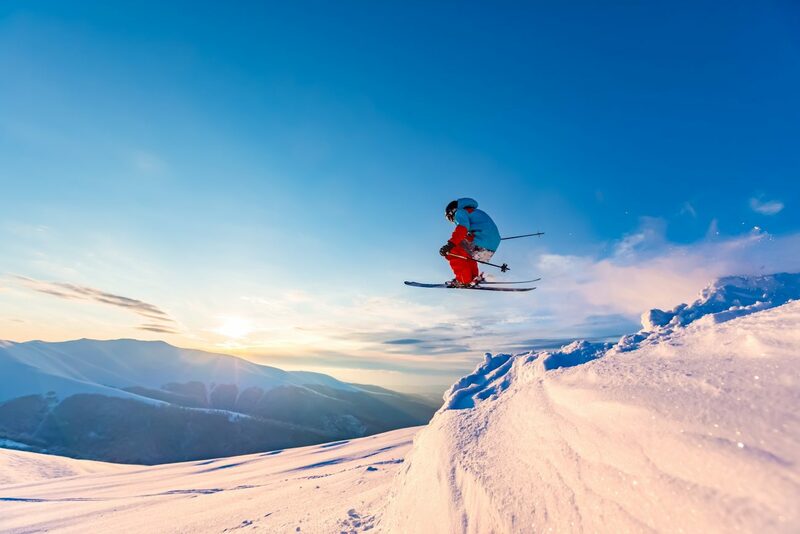 There are around 62 ski slopes suitable for beginners and children (12 slopes), amateurs (41 slopes), experienced skiers (12 slopes) with a total length of approximately 50 kilometers. All of them are well-equipped and have 14 modern ski-lifts. A daily adult ski pass will cost you near UAH 975. Keep in mind that prices are not cheap in Bukovel, typically 20% to 30% higher than in less-popular Ukrainian resorts. There is also a SPA all-year-round resort, as well as a medical center with its own source of mineral water. Tourists often prefer to stay in near ski resorts Yablunytsa (13 km. from Bukovel, has its own colored tracks – 9 slopes of red and blue difficulty levels) and Yaremche (30 km. from Bukovel, has 2 ski trails of 200 and 300 meters in length with a small height difference) enjoying well-priced accommodation and go to Bukovel for skiing and snowboarding. Dragobrat (18 km from Yasinia urban-type settlement, Zakarpattia oblast) – the highest ski resort in Ukraine located at the height of 1300-1400 meters above sea level with amazing landscapes located in isolation from the“civilization.” Such location ensures snow cover until late spring (seriously, often till the middle of May). This is a beloved spot for experienced skiers and snowboarders who are looking for extreme adventure. There is a great variety of routes (around 20 ski trails ranging in length from 300 m to 2 km), with a combined length of about 10 kilometers, as well as a freestyle track built to the international standard. It’s possible to travel even higher by snowcat vehicle, prolonging the slope and your fun for about two to three kilometers. A daily adult ski pass costs close to UAH 650 here. Note that it’s rather tricky to reach this extreme ski resort, as the only route passes through the mountains and requires all-wheel drive. It’s recommended that you travel to the nearest town, Yasinia (you can take a direct train there, “Kiev-Rakhiv”), and then take an off-road taxi to get to the resort (UAH 400 for the whole vehicle, or about UAH 100 per passenger). If you arrive in Yasinia in your own car, you can leave it in one of the paid-parking lots there. Slavske (130 kilometres southwest of Lviv, Lviv oblast). This is a very popular winter sports center famous for its Trostian mountain, which rises to 1232 m. The resort has six world-class ski trails, making it a beloved destination for advanced skiers. A daily ski pass will cost you about UAH 420 (+UAH 30 deposit). Slavske has numerous ski slopes rated at various difficulty levels, with a total length of about 22 kilometers, served by dozens of ski-lifts. So everyone from little beginners to world-class athletes will find slopes that fit their tastes and abilities. 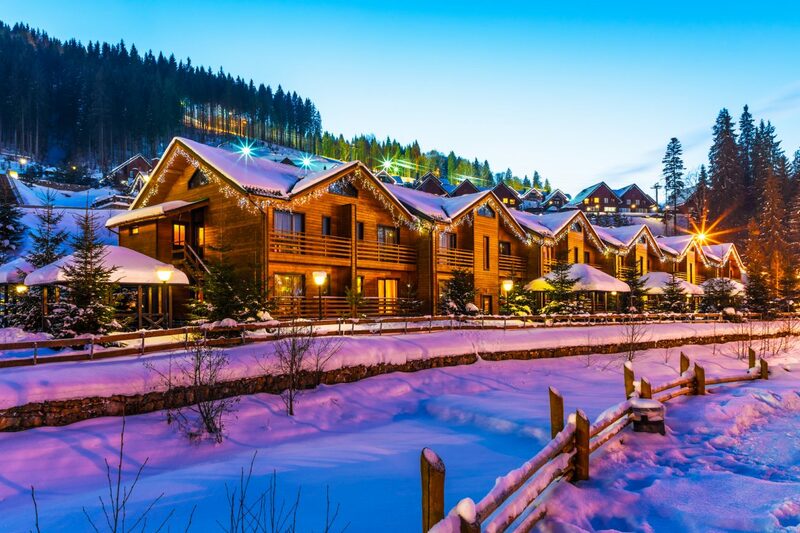 Overall, the well-developed infrastructure, good hotels, a wide choice of slopes, and direct train from Kiev make Slavske a very attractive destination for a winter getaway. Today, thanks to the development of a service industry in this region, in almost every place you stay you will be invited to visit a traditional bathhouse — known here as a temple of health, relaxation and beauty — and be treated to Hutsul Banusz (a delicious traditional dish popular in the Carpathian region, prepared from cornmeal topped with pork rind, mushrooms and bryndza (sheep’s milk cheese). What’s more, your trip to the Carpathians will turn into a bright discovery of mentality of Hutsul (an ethnocultural group of Ukrainians who for centuries have inhabited the Carpathian mountains) who carefully preserve and proudly tell about the ancient Ukrainian customs and traditions. If you want to experience the festive atmosphere of the Christmas holidays as they were celebrated more than a century ago — with Hutsul amusements, folk carols, trembita playing, and the vertep (a nativity scene representing the birth of Jesus) — the Carpathian region is a unique place you can’t miss! 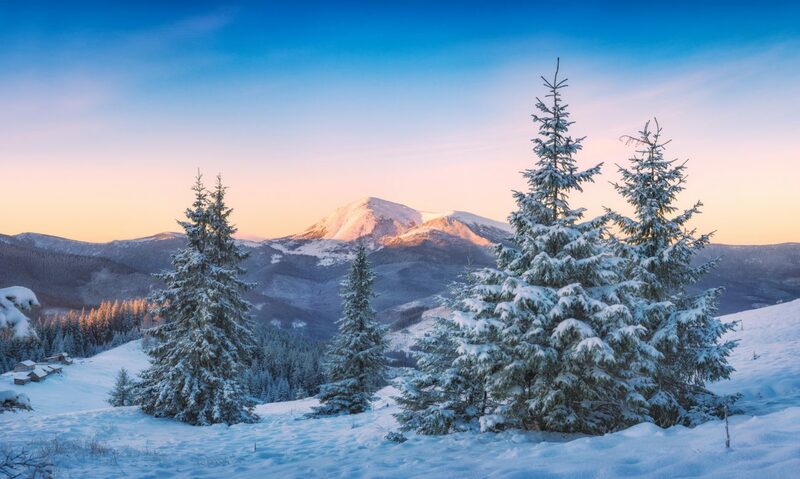 The Carpathian area has an intensely beautiful landscape, with majestic mountains and numerous spruce forests, covered with light snow and frost in winter. It’s a wonderful place to experience harmony with nature, draw inspiration for the whole year and take lots of wonderful pictures. To enjoy that breathtaking panorama to the full, many hikers are prepared to conquer the highest peaks. The Carpathians have no equal when it comes to such trips, as these mountains feature more gradual slopes and thus are very attractive for hiking. You’ll find routes suitable for various skill and physical-conditioning levels: one-, two-, and multi-day tours. No doubt, the rewards are worth the effort. The best time for climbing is from the beginning of May till the end of September. Mount Hoverla (2,061 m, Ivano-Frankivsk Oblast), translated as “snow mountain,” is the highest mountain in Ukraine and, thus, one of the most popular tourist destinations in the Carpathians. Every year, thousands of tourists climb the mountain. On the top you’ll find a Ukrainian flag; a stone cross; a coat of arms; an obelisk marking the highest point of what was once the border between Poland and Ukraine; and a marble slab containing capsules of soil from all the regions of Ukraine. Mount Hoverla is in the Carpathian Biosphere Reserve, which became part of the World Network of Biosphere Reserves of UNESCO in 1992. At the entrance to the Reserve, you will have to pay a nominal fee of about UAH 20-30. Brebeneskul (2,032 m, Zakarpattia Oblasts). This is the second highest peak in the Carpathians, with steep, stony sides. 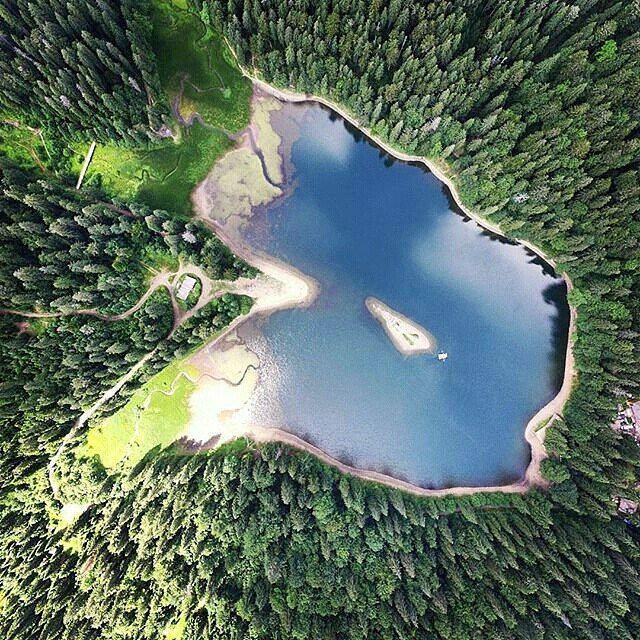 The country’s highest-altitude lake, also called Brebeneskul, is situated at an altitude of 1801 meters, in the shadow of the mountain. Petros (2,020 m, Zakarpattia Oblasts), or “storm mountain,” is one of the most dangerous and attractive mountains for tourists. Hutyn Tomnatyk (2,016 m, Zakarpattia Oblasts). Not far away is Lake Brebeneskul, mentioned above. All of these mountains are located in the highest mountain range in Western Ukraine, Chornohora. Fresh air, crystal-clear water, and clean soils are the greatest advantages of the Ukrainian Carpathians. This region is incredibly rich in mineral waters that made it one of the most popular recreational area among tourists. The list of the best health resorts in Ukraine includes Shayan spa resort (Zakarpattia Oblast) – used for the treatment with carbonated mineral water; Truskavets (Lviv oblast) – famous for its 14 mineral springs with their unique health properties (including well-known sulfur-scented, slightly saline “Naftusia”), reservoir of ozocerite (“mountain wax”) and Truskavets salt “Barbara”; Yaremche (Ivano-Frankivsk Oblast) – with more than 40 recreational facilities and health centers and about 50 sites of green tourism; Morshyn (Lviv oblast) – rich for mineral springs, peat (torf), mineral wax, a leader in the treatment of the liver, pancreas, intestine, stomach diseases and diabetes. 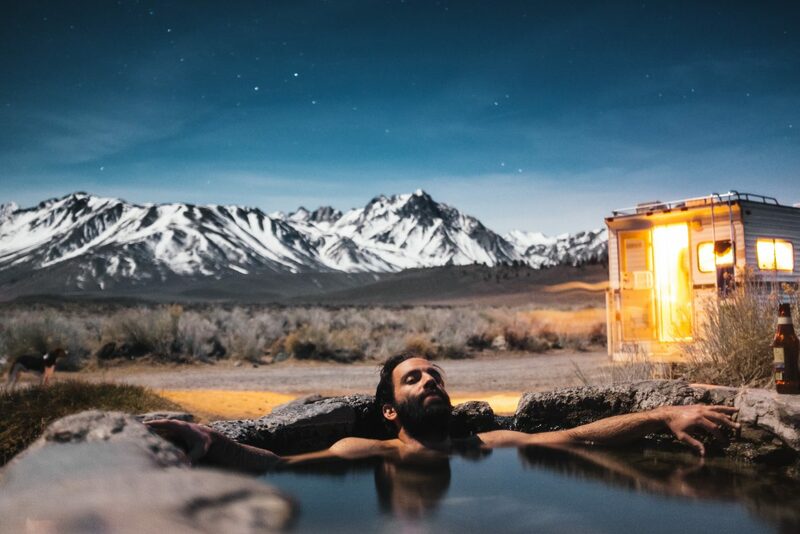 These and many other spa, hiking and skiing resorts in the Carpathians create favorable conditions for good rest as well as treatment for all visitors. If you’re still hesitating about a visit to the Carpathians in winter, this could clinch the deal! Rich in cultural and natural sights, this western wonderland is packed with castles, palaces, ancient parks, waterfalls, lakes, wine cellars, interesting museums, and well-preserved wooden churches you shouldn’t miss. I’ll talk about one of my favourites, a real gem also called the “Sea Eye” of the Carpathians, but believe me, there are many other wonderful places worth a visit in this area. 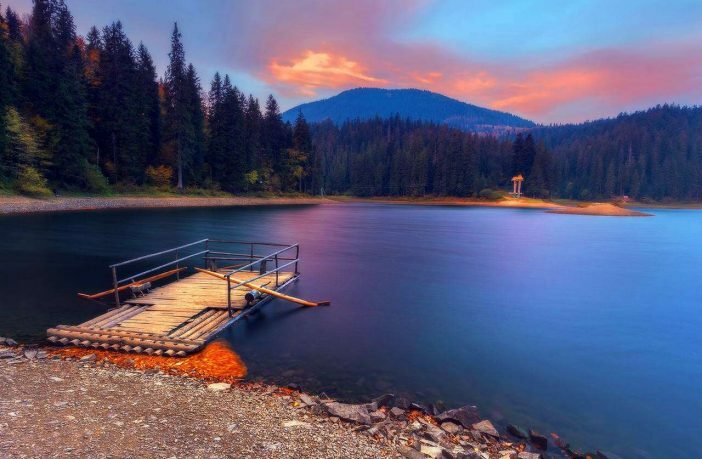 Lake Synevyr is the largest mountain lake in Ukraine, shrouded in Carpathian legends, secrets and romantic stories. It is famous for its extremely crystal-clear water, inhabited by trout, and recognized as one of the Seven Natural Wonders of Ukraine in 2008. This pearl is a part of the Synevyr National Nature Preserve and is surrounded by majestic cliffs and mountain forests. The smooth surface of the water has a beautiful blue sparkle, and a small island appears in the middle of the lake — calling to mind the blue “eye” of the nickname. Note, pitching a tent near the lake or lighting a campfire is strictly forbidden and may result in a large fine. But those who love camping may climb to the Ozirna meadow, which offers a charming view of Synevyr, and stay there for the night. There is an amazing story set at Synevyr, involving love between a girl named Syn and a man named Vyr, but let me stop right there, as it will sound all the more intriguing if you hear it on the spot. Keep exploring!